Trump's 'Zero Tolerance' family separation policy has had serious consequences. About a hundred migrant children separated from their families by immigration authorities when crossing the U.S. border without documents won’t be reunited with their families, according to a report by the Federal government. 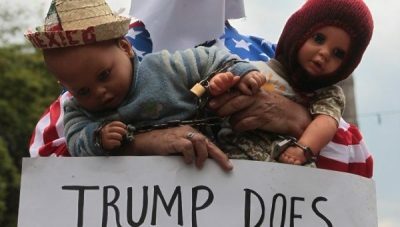 A report issued by the Health and Human Services Department, and obtained by the New York Times, stated that months after the ‘Zero Tolerance’ separation policy there are 147 children still under Federal custody, some of whom won’t be returned to their families. According to the report, 30 of those children were declared ineligible for reunification because of the parents’ criminal records, even though some of them refer to minor crimes that don’t really affect their capacity to take care of their children, according to migrant advocacy groups. The parents of the remaining 117 children have already been deported to their home countries, further complicating the reunification process. But there are groups of volunteers and social organizations looking for them in Central America and elsewhere, locating the relatives or parents of at least 106 of them. Seven of them are asking for their children to be returned home, but the remaining 99 stated that they would rather have them safe in a remote country that face the conditions they would experience in their country of origin, waving to their rights for reunification. That means at least 129 children won’t be reunited with their families. In June, a judge in California ordered the Trump administration to start reuniting about 2,000 migrant children with their families and established a 30-day deadline, which the government failed to comply with. Since then, the federal government has spent US$80 million in caring for and attempting to reunite the children with their parents, about US$30,000 per child. Previous reports by the Department of Homeland Security had revealed the institution was not prepared to follow the family separation policy, failing to keep track of locations at the time of separation. Trump’s policy ended up with thousands of family separated when crossing the border, since minors couldn’t legally be held in criminal custody. As a result, families were separated by border guards, and parents were deported while their children remained in custody in the U.S. Meanwhile, the Trump administration has reacted strongly to the migrant caravans coming from Central America in search for asylum in the U.S., imposing tighter restrictions and sending thousands of troops and security forces to the border.